QUALITY — Precision Aerospace Corp.
We continually seek to better understand and satisfy our customers' needs while adding value to the enterprise for all stockholders. We are AS9100 and Nadcap certified on all of our special processes. Quality isn't an afterthought in our process, it is developed in parallel with the machining process to create the most robust inspection plan possible. With the use of our APQP process, PFMEA's, MSA's and Control Plans, we deliver a perfect part on time and in budget. We are well versed in the supplying PPAP's and all of the documentation that goes along with it, even if it isn't required by our customer. The value of a well done PFMEA and Control Plan is worth much more than the time it took to develop when a part is in production. That is why we invest time into the preventative actions up front before we are in a machine to help with a flawless launch. 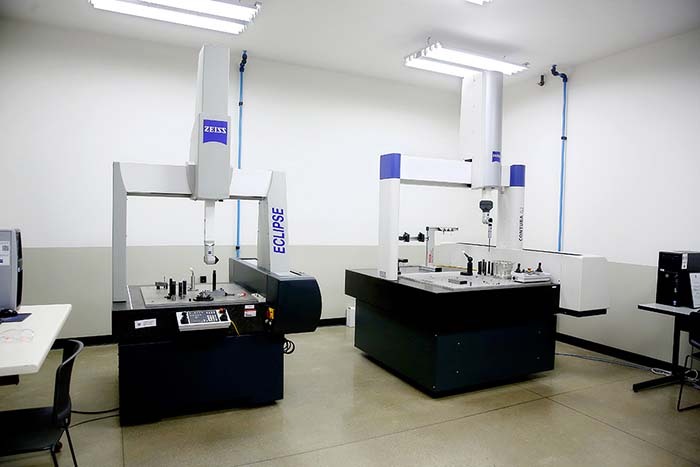 We have 5 quality labs strategically placed throughout the shop with right metrology in each to support the area surrounding it. With 6 Zeiss CMM machines, two with scanning heads, we are able to give the machine operator quick feedback on how their parts are running. We have also invested into a Zeiss Rondcom to inspect cylindricity, roundness and runout on our turn parts and a Zeiss CONTOURECORD form tracer to inspect very tight radiuses and forms on hard to inspect parts.